Here's a lil' ship I made a few weeks ago, to be modeled in 3d by another student soon. And that dude with the suspenders is the main character. 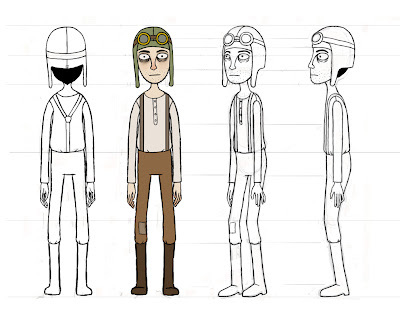 I actually wanted him to have smaller, football shaped eyes & a pointy nose (see my original design below), but after collaborating with other students, and being away in Mexico for a week, this is the final character model. He reminds me of salad fingers and my cousin mixed together. I have some animations from my alternative strategies for animation class that i can put up soon, maybe next week.